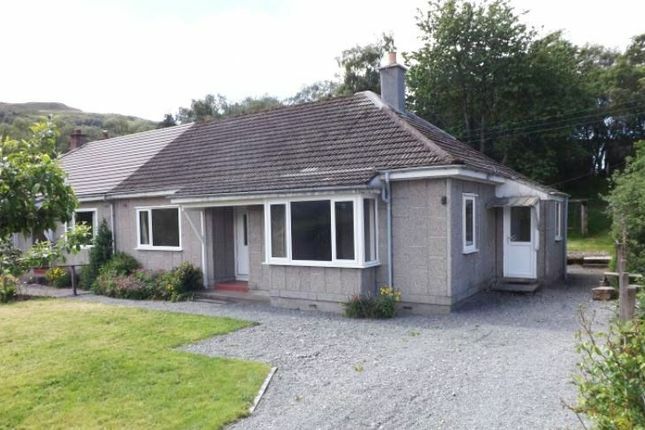 Three bedroom semi-detached bungalow of Doran construction. The accommodation comprises sitting room, kitchen, utility, three bedrooms and bathroom. The property benefits from solid fuel central heating via the wood burning stove in the sitting room. The property is in need of some internal refurbishment and modernisation. There is a stone chipped driveway and gardens to both front and rear. Achmore is a hamlet located close to the south shore of Loch Carron, approximately seven miles east of the village of Plockton, near Strome Ferry and within the Highland Council area, Scotland. The nearest main village is that of Kyle of Lochalsh some eleven miles away. The area is an attractive tourist destination which offers many local amenities. Additionally, there are many leisure activities on offer including a golf course, hill walking, climbing, fishing, and sailing. 5.36m (17'7") x 3.97m (13'0") Spacious sitting room with square bay window providing lovely open views. Additional window to side. Tiled fireplace and multi-fuel stove. 3.56m (11'8") x 3.06m (10'0") Rear facing fitted kitchen with beech wall and base units complementary work surfaces, tiled splash-back. Stainless steel gas hob with electric oven and extractor hood. Old style Rayburn range occupying recessed area of kitchen, two fitted storage cupboards. 3.09m (10'1") x 1.21m (3'11") Side facing room with door to rear garden. Slate tiled floor. 4.25m (13'11") x 3.23m (10'7") Spacious double bedroom with picture window to front providing open views. 4.13m (13'6") x 2.63m (8'7") Another double sized bedroom with large window over-looking rear garden. Fitted wardrobe. 2.95m (9'8") x 2.79m (9'1") Large rear facing window over-looking garden. Fitted wardrobe and shelved cupboard. 2.54m (8'4") x 1.70m (5'6") Rear facing bathroom with white three piece suite comprising wc, pedestal wash hand basin and bath with electric shower over. Tiled to wash areas. The front garden is mainly laid to lawn with mature hedging and a wooden style ranch gate allowing pedestrian and vehicle access. Spacious gravel drive. The rear gardens is mainly laid to lawn with a large timber shed. Please note that these particulars have been prepared by us on the basis of information provided by our client. If there is any aspect of these particulars that you wish clarified or that you find misleading please contact the office where further information will be made available. × No tests have been made of services, equipment or fittings. × No warranty is given or implied as to the condition of buildings, services, fixtures, fittings etc. × All measurements, distances and acres are approximate. × Fixtures, fittings and other items are not included unless specified in these details. This material is protected by the laws of copyright. The owner of the copyright is Auction House Scotland. The property sheet forms part of our database, and is protected by the database rights and copyright laws. No unauthorised copying or distribution without permission. Auction House Scotland is revolutionising the sale of property in Scotland. Remember, if you are buying a property which is being sold by Auction House Scotland you will normally be responsible for payment of a Buyer's Premium or Auction Fee, to a maximum of £2000 including VAT. More details can be obtained on application.